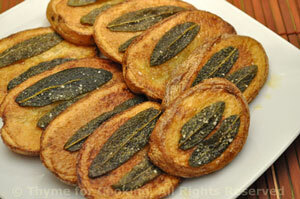 Crispy, Oven-Baked Potato Chips with Sage, easy, from Thyme for Cooking. Cut potatoes the long way into 3/16 inch (.4cm) thick slices. You should get around 5 slices from each potato - the first and last slices, being mostly peel and not flat, should be discarded. Put olive oil in large bowl and add potato slices. Mix with fingers to coat each slice. Remove potato slices and put on baking sheet with low edge - nonstick, if you have it. Bake in 400F oven for 30 minutes. Put the sage leaves in the bowl and toss to coat with oil - using fingers and adding oil if necessary. After 30 minutes remove potatoes from oven. With spatula lift up each potato slice and place a sage leaf under it. Remove potatoes and turn them so that the sage leaf is on top. Remove from oven and sprinkle with salt. Serve immediately.